An earthquake is what happens when two blocks of the Earth’s crust suddenly slip past one another (Wald, 2012). Although the Earth’s crust seems to be continuous, it constitutes of many pieces that are positioned beside one another, while others are on top of each other. These 'pieces' are called tectonic plates, and they are constantly in movement around the world. At times, however, the edges of these plates get stuck due to friction. When the edges of the plates overcome the friction, large amounts of energy are released in waves that travel through the earth's crust, and cause the shaking that we feel (Open Hazard). Why is B.C. at risk? Due to B.C.’s proximity to Canada's most volatile fault line, British Columbians live under the threat of a possible ‘megaquake’ every day (CBC, 2014). 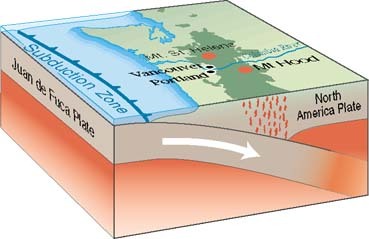 The Juan de Fuca plate is currently being forced beneath the North America plate. This is the reason B.C. experiences such high seismic activity. When a plate is being pushed under another, geologists call this a “Subduction Zone”. These subduction zones give rise to “megaquakes”; the planet’s most powerful earthquakes. These earthquakes have magnitudes that exceed 9.0 on the Richter Scale. Using the Mercalli Intensity Scale, we are able to measure intensity of earthquakes dependent on their magnitude. The last massive earthquake that shook the south coast of British Columbia took place in 1700, 314 years ago. Scientists were able to determine this date through sediment samples taken from the sea floor off the coast of Vancouver Island. These sediments indicated the coast’s seismic past. Audrey Dallimore, of the School of Environment and Sustainability at Royal Roads University, was also able to outline that earthquakes occur every 500 to 1,000 years. "What that means is we're due for another subduction zone earthquake either tomorrow — or 700 years from now," “[It] may happen within our lifetimes and will certainly happen at some time over the life of our communities and our infrastructures" (The Canadian Press, 2013). According to seismologist John Cassidy of Natural Resources Canada, “The West Coast of Vancouver Island would be most at risk if a powerful earthquake were to strike Southwestern B.C” (Farquharson, 2014).These areas would feel the strongest earth shaking. In Victoria Harbour however, the wave would be three to four metres high, and roughly half that height in Vancouver. How will B.C. be affected? According to the Insurance Bureau of Canada, the perils of an earthquake, tsunami, liquefaction, and landslide “would produce direct loss of about $58.6 billion for property, about $1.9 billion for infrastructure and about $1.5 billion for public assets. The total direct loss would be $62 billion, while indirect loss is pegged at about $12.7 billion” (Stelmakowich,2013). “Road access to the Vancouver airport will be cut off during the first few critical days after the earthquake because all the bridges to Sea Island would be affected. Nanaimo’s port, on the east coast of Vancouver Island, will be damaged so much it may be out of service for many months. There will be damages to buildings in Vancouver, Richmond and New Westminster, but it will be worse on Vancouver Island, particularly in Victoria, which has many old buildings. [As well,] Vancouver Island’s western edge will be hit hardest by the tsunami while Vancouver will be sheltered from the full brunt of the waves. The tsunami is estimated to hit Vancouver two hours after the quake” (Hoekstra, 2013). Just how much damage should we expect? A severe earthquake off the South coast of B.C., followed by a tsunami, would cause around $75 billion in damages to buildings, bridges, and pipelines. The cost is also a result of interruptions in business and services closures. (Hoekstra, 2013). Case in point, “B.C. 's emergency management agency (EMBC) is not adequately prepared for a catastrophic earthquake, according to the province's auditor general Russ Jones” (Laneela, 2014). Since a report conducted 17 years ago, neither the province of B.C. nor Emergency Management B.C. has made significant progress preparing for a megaquake. It has also been reported that the agency is working on the same budget allocation as 2006. As a British Columbian, it is very important to keep an eye on emergency officials like EMBC They report on the level of B.C.’s preparedness, its infrastructures, risk and capacity, and achievements. This will allow residents to better prepare themselves for emergencies. It is important for all British Columbians to take responsibility in preparing themselves and their families for an impending emergency. Remember, in an emergency there may be no cellular reception, landlines, bridges to cross, and electricity. As a result, individuals must be prepared to be entirely self-sufficient for at least 72 hours. Visit our shopsafetyproducts.ca site for a complete line of emergency preparedness products. For more information on how to respond to an earthquake when it strikes, visit our Emergency Preparedness page here.